Senior psychology major Ramona Creighton has two freshly inked tattoos of flowers and a black cat on her forearm. 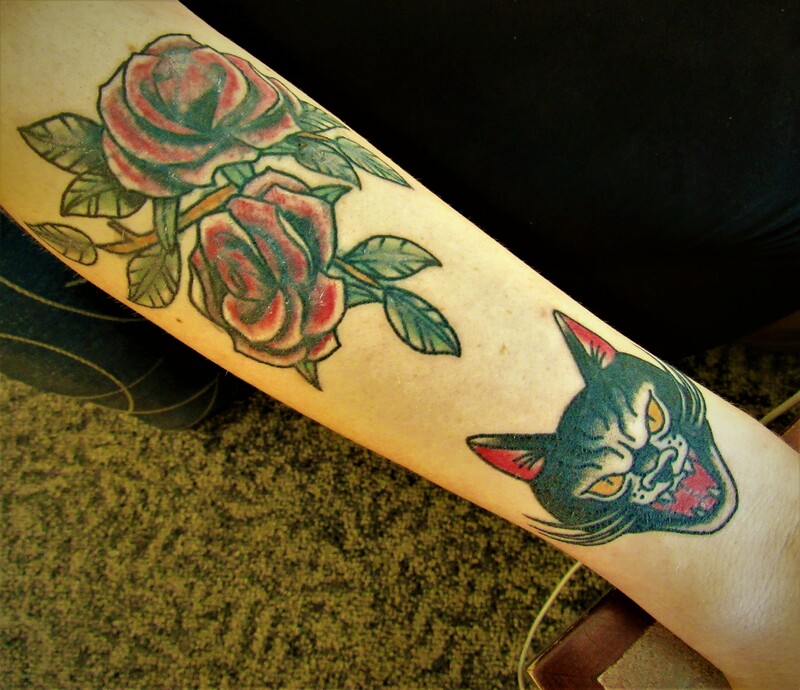 She got the black cat tattooed on Friday the 13th and intends to get a white cat that isn’t hissing on her opposite arm to represent good and evil. But the flowers are a cover-up. “I had a really s—-y stick and poke tattoo that I wanted covered up,” she explains. She says there is no meaning behind them, she just liked the colors and thought it was pretty. She has other tattoos that have meanings but feels that not all tattoos need to have a meaning behind them. Daniel Schaefer, a sophomore majoring in audio engineering, has one tattoo on his upper arm of a guitar comprised of musical notes. Music has been a big part of my life. Since I was five. I’ve played guitar for about twenty years, and it’s just the tattoo that meant the most to me,” says Schaefer. He got it shortly after high school, right after he stopped taking guitar lessons. Now music theory is his minor, and he said that plays into the tattoo as well. As far as future tattoos go, he does plan on getting more and says it will definitely be music-related. Melissa Ferguson, a senior in MTSU’s College of Media and Entertainment, says the birds are “the most meaningful” of her four tattoos. To participate in Tattoosday or to contact Lifestyles Editor Marissa Gaston, email lifestyles@mtsusidelines.com.